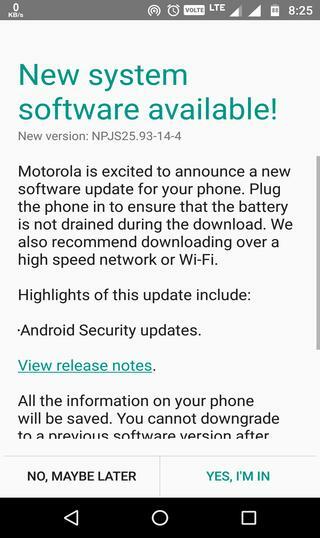 Motorola is finally rolling out a firmware update to the Moto G family, namely the Moto G4 and G4 Plus devices. The build number NPJS25.93-14 has been updated to a newer NPJS25.93-14-4 build, still based on Android 7.0 and not the Android 7.1.1. It includes the March 1, 2017, security patch from the AOSP, which is not the latest but it will optimize your device’s security. Moreover, upgrading the firmware will fix minor bugs and enhance the performance of your device. The update comes as an OTA(Over-The-Air) update and you will only receive it if you are running the stock Android 7.0. on your Moto G4. As the update is an OTA, it will eventually take some time to reach your device. 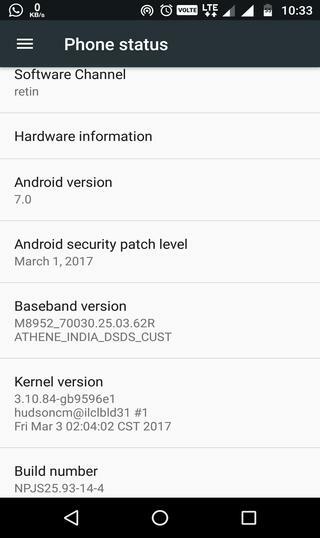 You can check the screenshots given below that shows the March 2017 security patch along with the changed build number. Few users from India are already receiving the OTA, this also means a broader rollout will happen soon in the other regions as well. The OTA is small in size, it weighs around 40MB and you can either download it on your mobile data or use a Wi-Fi network. Meanwhile, if you have not received the update on your phone you can follow these steps. Just go to the phone settings> about phone section> and check for system updates. If you are running the stock Android 7.0, you shall receive the same. The full firmware files are not available at the moment, we will update it once they are available. Check out the OTA from below. It is also compatible with XT1643 Indian variant alongside Brazil variant. In order to install the OTA update, head over to the previous OTA update tutorial for Moto G4 and G4 Plus. If you face any issue while installing the OTA, reach out to us via the comments section. Also, share your experience with us.